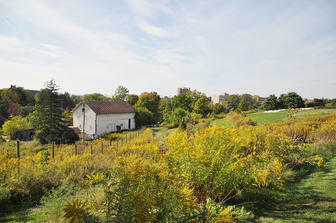 I am looking for a person to assist with the Cornell Small Farm Program. We have new funding to support training of beginning farmers. This individual would be part of our 3-year project management team. It is 0.50 FTE and only open to internal CU candidates at this point. More information at the Cornell OHR website, job number 11775. At 3 degrees Celsius warming [roughly what 550 ppm of CO2 would yield], we would have some chance to adapt, but if we allow emissions and temperatures to go higher than this, the impacts could be catastrophic and beyond our capacity to adapt. David Wolfe, professor, Department of Horticulture, in the Cornell Chronicle [11/25/2009], Climate experts debate strategies for reducing atmospheric carbon and future warming. 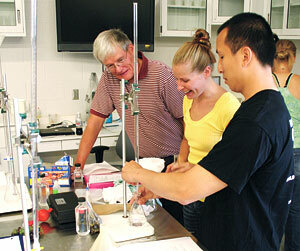 Wolfe studies the potential effects of carbon dioxide and climate change on natural and managed ecosystems. Bentos studies the economics of biofuels. Poinsettias ready for the Hortus Forum sale. Pre-orders are being taken right now! Contact Mason Newark at mjn68@cornell.edu to place your pre-order now. 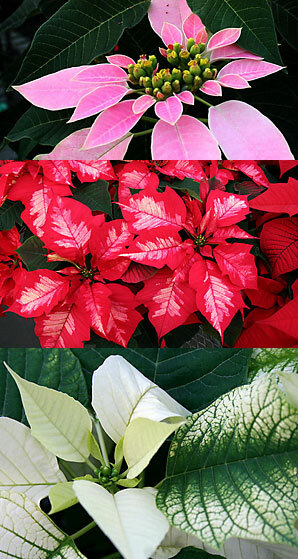 Live view of the poinsettias via the Dept. of Horticulture greenhouse cam. Wine Microbiology students evaluate grapes in the CALS Teaching Winery. Aspiring Vintners Move into New Teaching Winery – Short report on new teaching winery at Cornell Orchards: “The $900,000, 1,800-square-foot winery, attached to the Cornell Orchards, acts as the Ithaca hub for CALS’ new viticulture and enology undergraduate major, which enrolls roughly 30 students and draws on more than 50 faculty members from the horticulture, food science technology, plant pathology, and applied economics and management departments. Mann’s Rooftop Garden Named for Dean Susan Henry – Working with students in Peter Trowbridge’s landscape architecture class, John Dyson ’65, past chair of the CALS Advisory Council, and Janet McCue, former director of Mann Library, oversaw the beautification of the space—once an unsightly concrete expanse. The garden will be maintained by Nina Bassuk, professor of horticulture, and her students. New Apple Selections Are Fast-Tracked at 30 NY Orchards – Thirty New York orchard owners are growing new apple selections developed at CALS’ Agricultural Experiment Station in Geneva to test whether the apples could be a commercial success. Botanical Illustration II: Working with watercolor is a new online course to be taught by Senior Extension Associate Marcia Eames-Sheavly starting January 25. This is the second online botanical illustration course developed by Eames-Sheavly, a Kaplan Family Distinguished Faculty Fellow. It joins Botanical Illustration I: Basic Drawing Techniques in the growing stable of distance learning courses offered by the Department of Horticulture, which also includes online courses in organic gardening and plant propagation. Both of the six-week botanical illustration courses will be offered this winter. Cost is $500 and enrollment is limited to 20 students. “The new watercolor course is designed to encourage your discovery of plants as the subject of art and to express your interest in the plant world by introducing color to your botanical illustration repertoire,” says Eames-Sheavly. 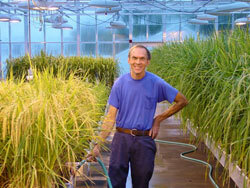 For more information, visit the Department of Horticulture’s Distance Learning site. The New York Beginning Farmer Project also offers Beginning Farmer 101 online courses. The next one, Markets and Profits: Making Money Selling What You Grow, starts Jan. 8. After 31 years of hard work and dedication, it’s time to take a permanent vacation! Please join us as we celebrate and offer Bill Thompson best wishes in his retirement. Refreshments will be provided, just bring a smile and some good stories! We are working on preparing a scrapbook for Bill to keep. We would like everyone to write a little something to or about Bill. Please send us your contributions as soon as possible, and we will place them in the book for you. If you prefer to write your own in the book, just let us know and we will find a time for you to do so. Any donation towards gifts is greatly appreciated. A card will be available for everyone to sign. We are attempting to keep details of the party a secret, so please do not call 255-5494. Contact Kim Goodwin by cell phone or email (kg10@cornell.edu, 227-5890) with any questions, donations, and contributions. New wineries are sprouting up around the state, investments are growing, and visits by tourists and wine lovers have increased by more than 20 percent since 2003, despite record gasoline prices in 2008. A survey of 169 wineries conducted by the National Agricultural Statistics Service, part of the U.S. Department of Agriculture, found that the state wine industry not only has weathered the recession but also has exploded in size. This internship will provide the opportunity for a Cornell University student(s) with a demonstrated interest in garden-based learning to engage in an intensive experience over the course of two consecutive fall and spring semesters (Fall 2010 and Spring 2011). The student will work with the Cornell Garden-Based Learning Program to carry out activities with Kids Growing Food, a project of the NYS Ag in the Classroom Program. Dilmun Hill student organic farm.